An early morning flight from Terminal 5 Heathrow, so used the BA app to check-in the night before. A very easy system, and with no need to use the self-check-in machines it takes just 5 minutes from arriving at Terminal 5 to clear security. An effective boarding service is provided for business class and priority passengers. The flight is quiet and main cabin boarding takes no time at all. The purser provides a positive welcome at the aircraft door and proactive staff located throughout the cabin means the overall boarding process is very quick. A321 in Economy Class is only about one third full. Ticket type purchased allows just hand luggage, but with 1 bag and 1 laptop bag both able to be a max of 23kg, this provides plenty of flexibility. Baggage allowance varies depending on ticket type but the Euro Traveller standard fare also allows for 1 checked baggage with a max weight of 23kg. If you choose to buy a “basic” fare ticket, checked baggage can be purchased for between 20 GBP and 60 GBP depending on destination, departure airport and time of purchase. This is more expensive than some airlines such as easyJet who charge between 13 GBP and 45 GBP (however, the allowance is not as generous). The Economy Class seat has a 30-inch seat pitch, the same as Ryanair and only 1 inch bigger than the 29-inch seat pitch you will find on easyJet. It’s certainly not spacious but the seat is comfortable and for this 90-minute flight it’s okay. There’s no in-seat power available and several airlines are now providing this facility on narrowbody aircraft. The cabin and washrooms are well maintained and environment onboard is pleasant. The tables had been wiped down and there was no rubbish or marks from the previous flights. It presents a strong first impression when boarding and the dark leather seating looks good. The flight departs 10 minutes behind schedule and arrives into Berlin 15 minutes late. Delays are clearly communicated by the flight deck, who offer excellent announcements before departure and after arrival. 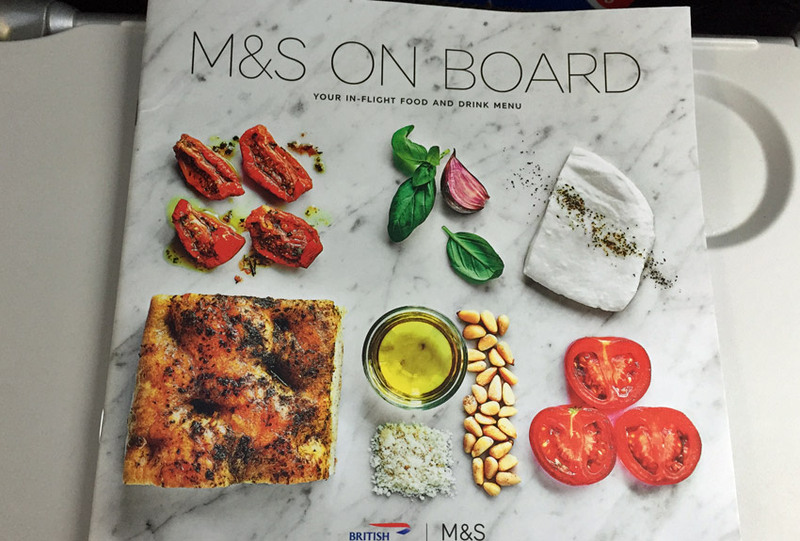 BA is now offering their new buy on board service, in partnership with UK high street retailer Marks and Spencer, and I was looking forward to seeing what this new service had to offer. The service is currently available to and from Heathrow and Gatwick and will available from Stansted and London City in the summer. 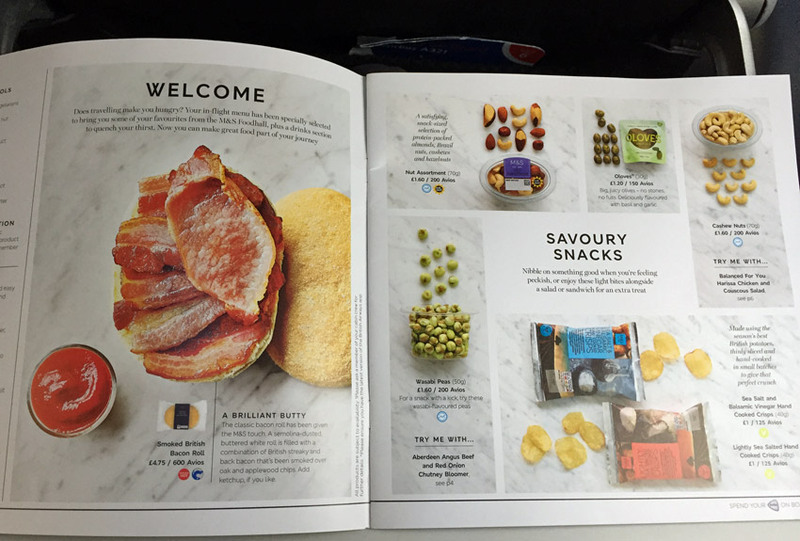 The initial impressions of the product is good, with a Marks and Spencer menu located in every seat pocket and products featured looking very good. What it doesn’t offer are any decent hot meals and a bacon roll or toasted sandwich are the only options. Aer Lingus on the other hand offers passengers a full English breakfast meal and Ryanair offer several different hot meal options. Around 15 minutes after departure a crew member moves through the cabin taking hot meal orders, and shortly after the other staff start serving all other items (including drinks, sandwiches and cold snacks) from a cart. After 5 minutes, it is apparent the biggest issue with the service is going to be speed. On this A321 the crew only use 1 bar cart to serve all the items and even on this flight with around 30% capacity they only just got around to everyone. From the very beginning the crew looked fed up with the process and quickly tell me that with a full cabin, and with a reasonable uptake in orders, it can take over 2.5-hours to move through the whole cabin. How BA can possibly expect to carry on with the service in its current format, I’m not sure. It seems they have replaced a service where passengers were guaranteed some free, albeit basic food, and a free drink, with a service where on a flight under 2.5 to 3-hours there is a very real chance of not getting anything. On this 90 minute flight, and with only 30% capacity they only finished the service 10 minutes before the top of descent. Fortunately, the bacon roll I ordered shortly after departure showed up quickly, and the quality is the saving grace of the whole service. It is delicious, packed full of bacon and excellent. It does only come with tomato sauce – no brown sauce, and this may frustrate some! Whilst the bacon roll is great, I had to wait 20 minutes before being able to buy a drink from the cart and I can only imagine on busier flights some passengers might go without. I had reservations about how far British Airways has gone when it comes to the service. Every passenger, regardless of Executive Club membership, is expected to pay for food and drink in Economy Class. 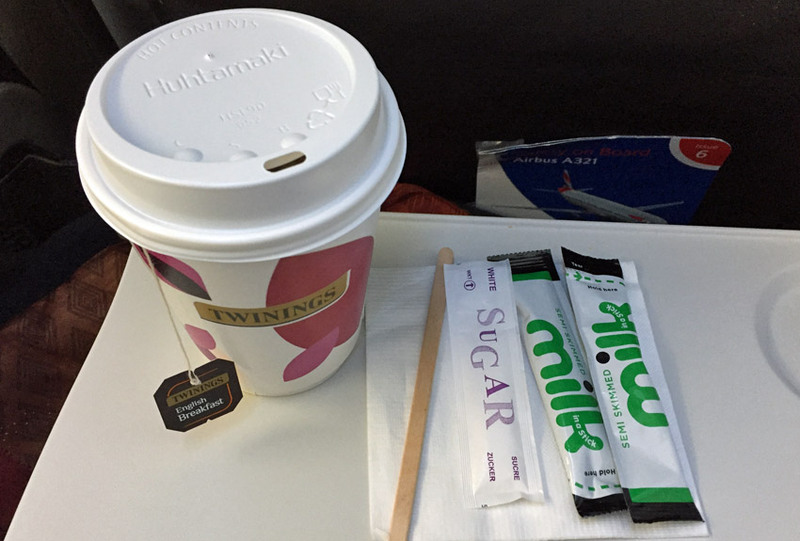 Considering BA does not offer Business or First Class on domestic routes, an International First Class passenger with a domestic connection, will be expected to pay 1.80 GBP for a bottle of water. It’s also worth noting ticket prices are unlikely to drop because of the new service and whilst the pricing on some fares is quite competitive with low cost airlines, some fares remains very expensive and short notice bookings are noticeably higher. Cost wise, the products are comparable to BA’s low cost rivals. 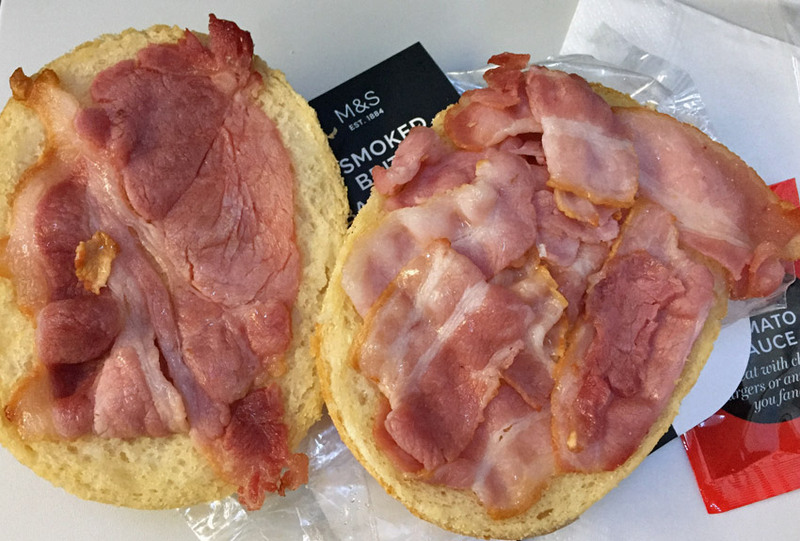 A bacon sandwich and a cup of tea will cost passengers 7.05 GBP compared to 7.00 GBP on easyJet, although it does come in slightly cheaper than sister airline, Aer Lingus. 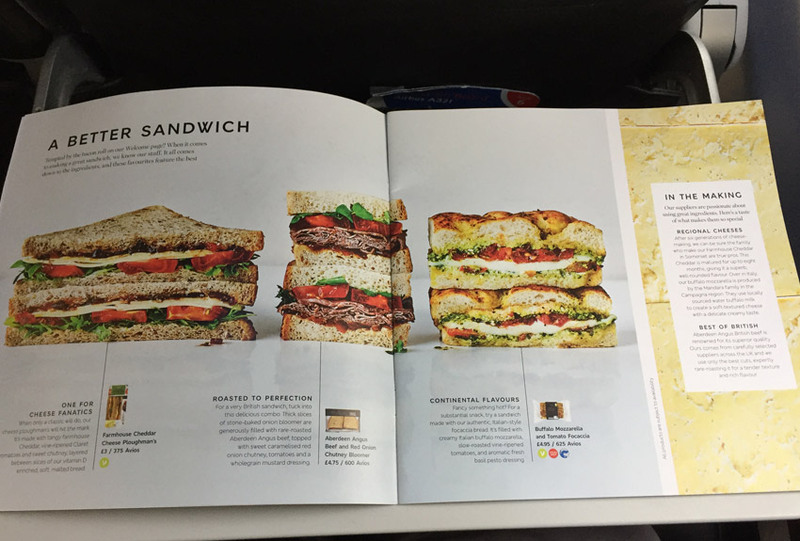 An issue immediately apparent is BA do not offer any meal combos or price saving promotions, so unlike easyJet and Ryanair, you can’t save any money when purchasing a number of different items together. In terms of airport comparison, a meal deal (sandwich, crisps and a drink) at a convenience store comes in at nearly 50% cheaper, whilst if passengers want a tea and bacon sandwich in Starbucks they can expect to pay 2 GBP less. Another issue with the service, is the only free item is poured water from the galley. All beverages, including water, tea, coffee and soft drinks must be paid for. A small can of coke or bottle of water will set passengers back 1.80 GBP , and no matter how many times I’m told it’s perfectly healthy, I’ll never be happy with the idea of drinking water from airplane taps. Payment is another area where I am surprised they do not accept any cash and all purchases must be made on card, or for Executive Club members, with Avios. I’d read before boarding that some flights have had issues with the payment system but this seemed to have been sorted. There is no inflight entertainment onboard the majority of BA narrow body aircraft, although that will change with the introduction of WiFi and streaming. There are no comforts onboard, with no pillows or blankets available. The overwhelming feeling I get from the staff is one of stress and annoyance. Whilst polite and friendly to passengers they were struggling to deal with the extra workload for the new Buy on Board service and by the time they reached my seat towards the back of cabin they looked like they had had enough. It’s a lot of work for the cabin staff, and it means they didn’t have time to provide any proper conversation or service enhancements which used to sometimes make BA service stand out from low cost carriers. Yes, the crew were friendly, but it wasn’t any better than flights I’ve taken with easyJet or Ryanair and offered no lasting impression. I’d rather save money and get a meal deal at the airport, and since the cabin staff are so busy with the service they no longer have any time to interact with passengers on any meaningful level. If you’re on a short flight there’s definitely the possibility of not even being offered a drink and if you’re a BA executive club member, the failure to offer any free enhancements is bordering on outrageous. Ultimately, one’s satisfaction with BA will be now be based mainly on cost. When asking what is the difference between BA and their low-cost rivals, the simple answer is that once onboard there isn’t any. With Ryanair and easyJet serving an increasing number of mainline airports, it is a further dent in British Airways competitive advantage. I would book BA again only if they were the cheapest option or I wanted to take advantage of their more generous cabin baggage allowances, but they have a lot of work to do to make this buy onboard system work well.